The ambulance driver in the Kashmir uprising of 2016 was nothing less than a stretcher-bearer in the trenches of First World War. The drivers, amidst a military siege, and pellet and bullet bombardment helped in saving thousands of lives, bravely dodging every hurdle in the path of healing. Ambulance drivers exhibited a commitment beyond heroic in this period of state-sponsored bloodbath, holding true to their bedrock principle of medical neutrality. There was not a single report of Kashmiri ambulance drivers withholding medical assistance for Indian forces or giving preference to protesters over the other side. Despite this, ambulances, ferrying injured protesters to hospitals, systematically became a target for the brutality of Indian forces. In many cases, due to interception at checkpoints manned by the Indian forces personnel, injured protesters succumbed. One such case was that of Aamir Nazir Latoo, a grad student of Aligarh Muslim University, who was martyred after Indian forces personnel barged into the Ambulance, ferrying Aamir to a Srinagar hospital, and ripped the IV tubes attached to his arms. Again, in September, 16 year old Saqib Ahmad, who volunteered with Social Reform Organization at SMHS hospital to work as an Ambulance driver, was shot at with pellets by Indian forces while dropping off a patient in Palpora area of Srinagar. The metal balls entered Saqib’s face, neck and abdomen. In another atrocious act of ruthlessness, Indian forces stopped and thrashed a bullet ridden Azad Ahmad Thoker, thrice on his way to a hospital located in Srinagar. 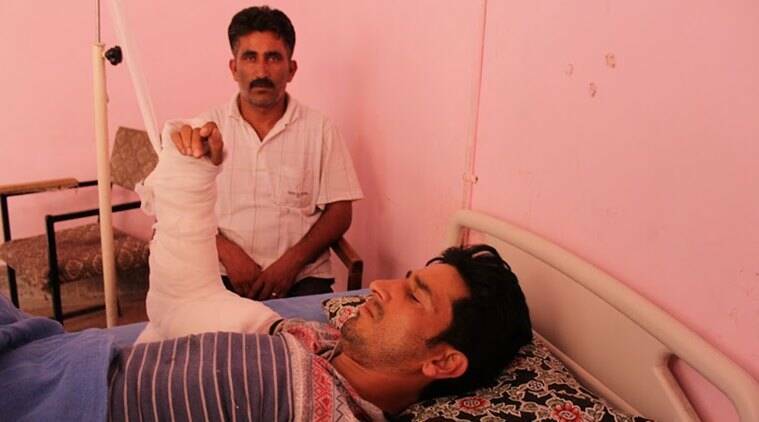 Azad was hit when Indian army’s RR indiscriminately fired on a pro-freedom procession at Nehama village in Kulgam. “When we crossed the Sangam Bridge, both police and CRPF manning there pounced on us, they beat all of us including the driver, snatched the keys from him and broke down all the glasses of the ambulance. They didn’t stop there. They tore off bandages from Azad’s wounds resulting in heavy bleeding and then removed his drip and blood transfusion too,” Azad’s father later narrated to the reporters. This serious breach of International human rights law was condemned by international human-rights organizations such as Amnesty and Physicians For Human Rights. However, amidst a all-out medical emergency in Kashmir, a report emerged in July that some Ambulances were being abused to ferry “VVIP” Indian tourists to health resorts for picnicking. While some ambulance drivers resisted this but they were threatened with termination by the state authorities, the report said. Also, while all forms of communication were barred by the state authorities, Ambulance drivers, ironically, became the only sources of information emerging out in the face of brutal state crackdown. The ambulance drivers in Kashmir played a massive role in mitigating the state-perpetuated suffering of people while bravely evading the serious risks to their personal life and limb. The only people that are worthy of absolute impunity in Kashmir are these super-humans of remedy.